The November FOMC meeting is scheduled for November 7 & 8, one day after the November 6 midterm election. We are not looking, then, at the possibility of any further FOMC action on interest rates that might influence the election one way or another, but what about after the election? Is the FOMC likely to increase rates another 25 basis points at this next meeting? Let us look at what information the FOMC will have next week. 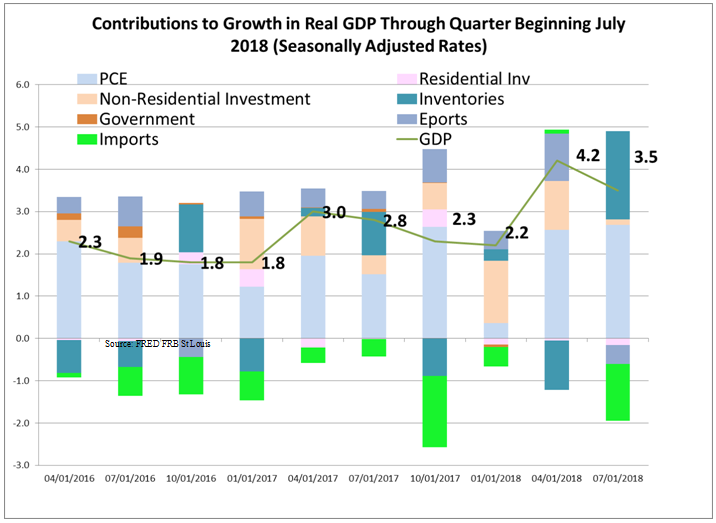 The bulk of the economic data that has arrived since the last FOMC meeting is not only very positive but also consistent with the FOMC’s projections. 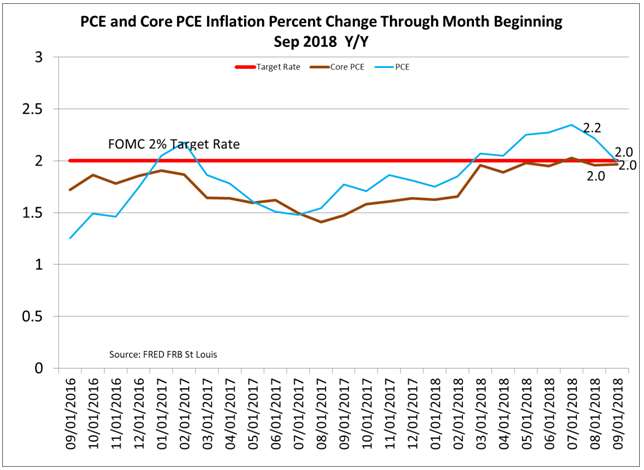 On the inflation front, both of the FOMC’s preferred measures of inflation – headline inflation and the core Personal Consumption Expenditure Index (PCE) – actually declined in September, as the attached chart shows; and inflation now sits right on its target of 2%. More importantly, there are few signs of its accelerating. Energy prices have started to slow, and the rate of growth in housing prices has dropped below 6% for the first time in a year. Both of these components’ prices typically start accelerating as inflation pressures increase. Job-market data show a tight labor market, with more vacancies than unemployed people and an unemployment rate of 3.7%. 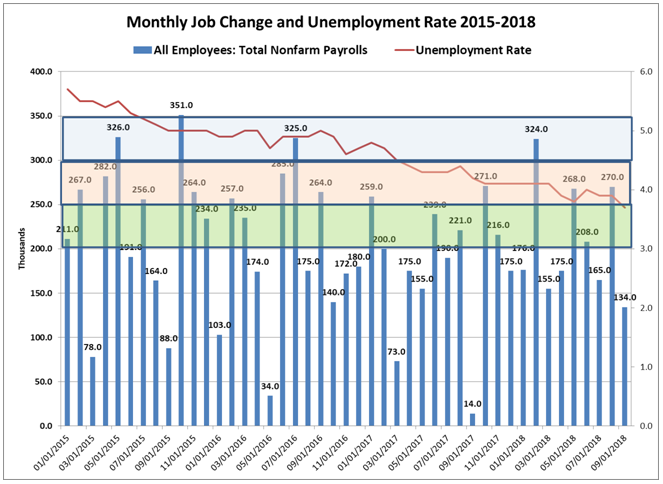 Job growth, too, has been positive, with an average 208K jobs per month being added this year, as shown in the next chart. Today’s 250k jobs numbers continue the solid trend shown in the above chart. While these numbers look good, based upon recent history since the end of the financial crisis, they are more consistent with an economy growing at the rate of 2.2–2.4% and an economy growing at 3.5%–4.2%. Interestingly, if the economy today were creating jobs at the same rate it did between 1983 and 2006, the monthly jobs numbers would be twice what they are presently. So with the economy on track with the FOMC’s projections and with no indications that inflation is accelerating, the FOMC can afford to stick with its projection for just one more rate hike this year. There is no planned press conference for the November meeting, nor will there be formal revisions to the FOMC’s Summary of Economic Projections. Given these facts, the chances are slim to none that there will be a rate hike next week.